distribution Primarily the Sandhills region, but sparingly east to the southeastern corner of the state. As NC lies at the northern end of the range, the current northern limits are Craven, Sampson, and Moore counties. abundance Generally uncommon and local, eastward to Sampson and Bladen counties, and very rare east to Carteret County. Fairly common at a few favored locales in the Sandhills. flight A spring-season flight only, unusual for a bluet. The flight occurs from early April to mid-June, but is mostly over by mid-May. habitat Sandy-bottomed lakes or large ponds, with emergent vegetation along the shore. comments Though there are many dragonflies with a flight period in the spring season only, there are few such "spring only" damselflies. 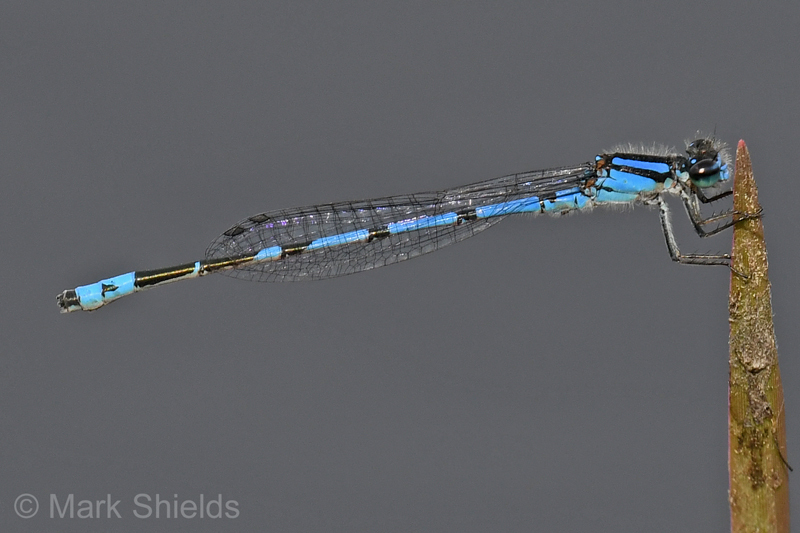 As with the Cherry Bluet, the species does not seem quite scarce enough to be considered as a Watch List species by the NC Natural Heritage Program. Thankfully, we now have a few recent records away from the Sandhills, documented by photos, from as far east as Carteret County and southeast to Brunswick County. Surprisingly there are no records yet for Cumberland County, much of which lies in the Sandhills region. Photo by: R Emmitt and super DSA crew!